There's a person.... The Airship Ventures offices are getting a little crowded while we are waiting to move into our permanent larger space but still increasing the team. I took a few snapshots on Wednesday. 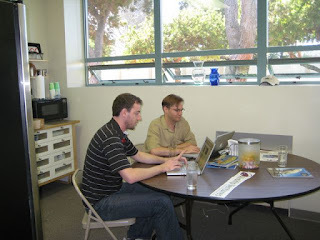 Dustin (web producer) and Brian (President) working hard at the kitchen table to QA and finish up the website. 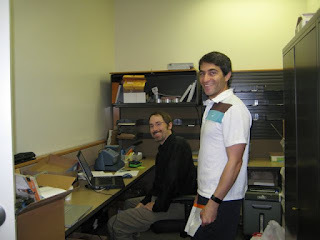 Brian K (Interim IT Manager) and Al setting up an impromptu IT department in the copy/mail room. And its about to get tighter with all our guest services team coming aboard!